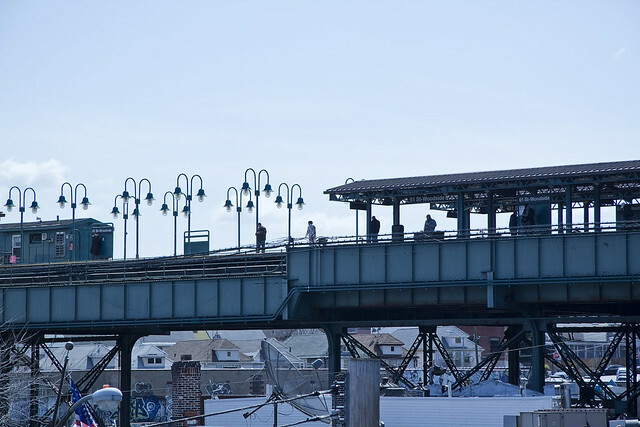 Another of the locations which recent efforts assisting the estimable Kevin Walsh in his “2nd Saturdays” series of walking tours brought me to was the Woodside LIRR station. For an infrastructure geek like myself, this facility offers an immersion in total joy. 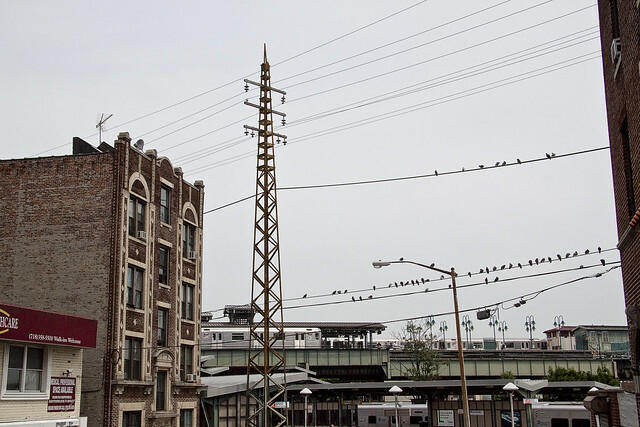 The MTA elevated lines which follow Roosevelt Avenue soar above, while on a lower level sits a separate system of trussed steel- the east and west tracks of the LIRR shuttle commuters back and forth between Shining City and crowded suburbs in an easterly suburbia. 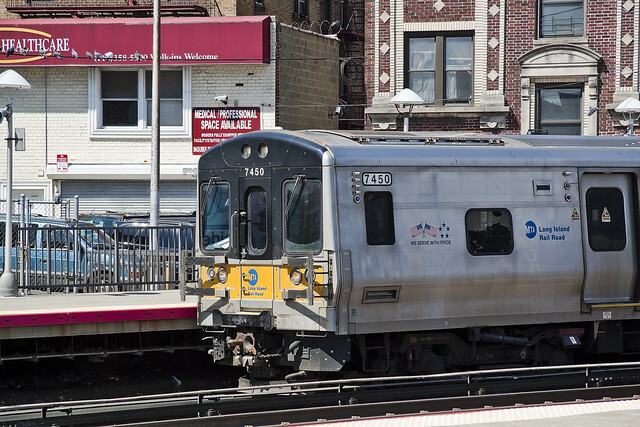 Mr. Walsh himself was to arrive on one of these LIRR trains, and I humbly awaited the master. Woodside is a neighborhood in the western portion of the New York City borough of Queens. 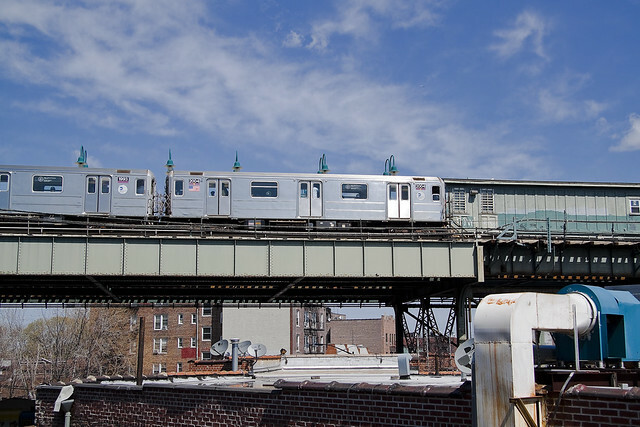 It is bordered on the south by Maspeth, on the north by Astoria, on the west by Sunnyside and on the east by Elmhurst and Jackson Heights. Some areas are widely residential and very quiet, while others (especially closer to Roosevelt Avenue) are more urban. The neighborhood is located in Queens Community Board 1 and Queens Community Board 2. In the 19th century the area was part of the Town of Newtown (now Elmhurst). The adjacent area of Winfield was largely incorporated into the post office serving Woodside and as a consequence Winfield lost much of its identity distinct from Woodside. With large scale residential development in the 1860s, Woodside became the largest Irish American community in Queens. In the early 1930s, the area was approximately 80% Irish. Even as the neighborhood has seen growth in ethnic diversity today, the area still retains a strong Irish American presence. There are a number of Irish pubs and restaurants scattered across Woodside. While pacing nervously, I was keenly aware of interested glances from local constable and fellow citizen alike. That shabby man, unshaven and clad in a filthy black raincoat… What is he doing? He looks nervous and occluded, that sweaty fellow who is avoiding eye contact with others. Why is he pacing back and forth like that, and what might he be carrying in that enormous black bag? Doesn’t he seem anxious, as if waiting for something to happen? Being noticed by the conservative and bourgeois is something that has plagued me always- even as a schoolchild, in auditorium assemblies populated by a thousand maniacs- fellow younglings screaming and dancing about while your humble narrator was quietly reading… I would be singled out for excoriation by certain factions of the school administration which always displayed open hostility to me. Even today, coworkers might be snorting a line of amphetamines off their desks and I will be called to task for an empty coffee cup left too long untended. The Mythological Cycle, comprising stories of the former gods and origins of the Irish, is the least well preserved of the four cycles. The most important sources are the Metrical Dindshenchas or Lore of Places and the Lebor Gabála Érenn or Book of Invasions. Other manuscripts preserve such mythological tales as The Dream of Aengus, The Wooing Of Étain and Cath Maige Tuireadh, The (second) Battle of Magh Tuireadh. One of the best known of all Irish stories, Oidheadh Clainne Lir, or The Tragedy of the Children of Lir, is also part of this cycle. Lebor Gabála Érenn is a pseudo-history of Ireland, tracing the ancestry of the Irish back to before Noah. It tells of a series of invasions or “takings” of Ireland by a succession of peoples, the fifth of whom was the people known as the Tuatha Dé Danann (“Peoples of Goddess Danu”), who were believed to have inhabited the island before the arrival of the Gaels, or Milesians. They faced opposition from their enemies, the Fomorians, led by Balor of the Evil Eye. Balor was eventually slain by Lug Lámfada (Lug of the Long Arm) at the second battle of Magh Tuireadh. With the arrival of the Gaels, the Tuatha Dé Danann retired underground to become the fairy people of later myth and legend. The Metrical Dindshenchas is the great onomastic work of early Ireland, giving the naming legends of significant places in a sequence of poems. It includes a lot of important information on Mythological Cycle figures and stories, including the Battle of Tailtiu, in which the Tuatha Dé Danann were defeated by the Milesians. It is important to note that by the Middle Ages the Tuatha Dé Danann were not viewed so much as gods as the shape-shifting magician population of an earlier Golden Age Ireland. Texts such as Lebor Gabála Érenn and Cath Maige Tuireadh present them as kings and heroes of the distant past, complete with death-tales. However there is considerable evidence, both in the texts and from the wider Celtic world, that they were once considered deities. Even after they are displaced as the rulers of Ireland, characters such as Lug, the Mórrígan, Aengus and Manannan appear in stories set centuries later, betraying their immortality. A poem in the Book of Leinster lists many of the Tuatha Dé, but ends “Although [the author] enumerates them, he does not worship them”. Goibniu, Creidhne and Luchta are referred to as Trí Dé Dána (“three gods of craftsmanship”), and the Dagda’s name is interpreted in medieval texts as “the good god”. Nuada is cognate with the British god Nodens; Lug is a reflex of the pan-Celtic deity Lugus, the name of whom may indicate “Light”; Tuireann may be related to the Gaulish Taranis; Ogma to Ogmios; the Badb to Catubodua. Such persecution, coupled to my own antisocially vicious nature and bizarre mannerisms, has resulted in a very thin skinvelope surrounding your humble narrator. Paranoid, socially crippled, and hostile, in order to stave off madness a decision was made long ago to hide in public. Scuttle about the edges of this vile infestation and gross exaggeration of the human hive, and avoid all but topical contact with it’s residents. A cocoon was spun, and happily occupied. In recent years, however, novel philosophies and aspirations have motivated me to move in different and delusional directions and to scuttle forth and walk the earth. According to an Irish dinsenchas (“place-lore”) poem in the 12th century Book of Leinster, Crom Cruach’s cult image, consisting of a gold figure surrounded by twelve stone figures, stood on Magh Slécht (“the plain of prostration”) in County Cavan, and was propitiated with first-born sacrifice in exchange for good yields of milk and grain. Crom is said to have been worshipped since the time of Eremon. An early High King, Tigernmas, along with three quarters of his army, is said to have died while worshipping Crom on Samhain eve, but worship continued until the cult image was destroyed by St. Patrick with a sledgehammer. This incident figures prominently in medieval legends about St. Patrick, although it does not appear in his own writings, nor in the two 7th century biographies by Muirchu and Tírechán. In the 9th century Tripartite Life of Saint Patrick the deity is called Cenn Cruach, and his cult image consists of a central figure covered with gold and silver, surrounded by twelve bronze figures. When Patrick approaches it he raises his crozier, the central figure falls face-down, with the imprint of the crozier left in it, and the surrounding figures sink into the earth. The “demon” who inhabits the image appears, but Patrick curses him and casts him to hell. Jocelin’s 12th century Life and Acts of St. Patrick tells much the same story. Here the god is called Cenncroithi, interpreted as “the head of all gods”, and when his image falls the silver and gold covering it crumble to dust, with the imprint of the crozier left on bare stone. Childish and puerile, my pedantic credos include “what would Superman do?”, “do what you say, and say what you do”, “the world only makes sense when you force it to”, and the recently added gem “make no assumptions”. Accordingly, while walking this strange path that I’ve found myself on, an attempt to maintain an open mind and absorb as much knowledge as possible from the best sources available has been underway. 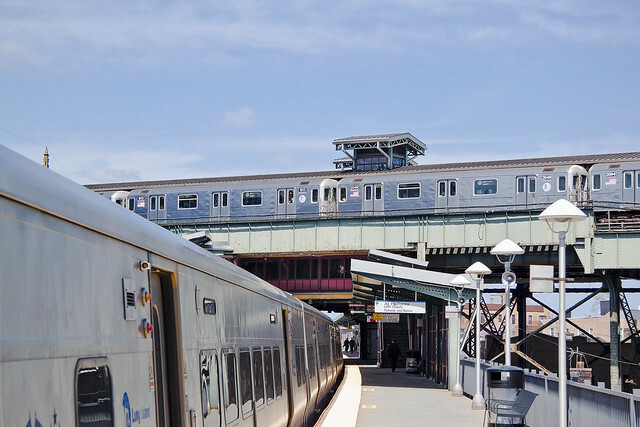 Which brings me back to why I was attracting so much interest from gentry and security personnel alike while waiting for Mr. Walsh at the LIRR station in Woodside, Queens. In Irish and Scottish mythology, the Cailleach (Irish pronunciation: [ˈkalʲəx], Irish plural cailleacha [ˈkalʲəxə], Scottish Gaelic plural cailleachan /kaʎəxən/), also known as the Cailleach Bheur, is a divine hag, a creatrix, and possibly an ancestral deity or deified ancestor. The word simply means ‘old woman’ in modern Scottish Gaelic, and has been applied to numerous mythological figures in Scotland, Ireland and the Isle of Man. In Scotland, where she is also known as Beira, Queen of Winter, she is credited with making numerous mountains and large hills, which are said to have been formed when she was striding across the land and accidentally dropped rocks from her apron. In other cases she is said to have built the mountains intentionally, to serve as her stepping stones. She carries a hammer for shaping the hills and valleys, and is said to be the mother of all the goddesses and gods. The Cailleach displays several traits befitting the personification of Winter: she herds deer, she fights Spring, and her staff freezes the ground. Of course, I seldom go anyplace in Queens these days without reading up on it, and this station was at the edge of the John Andrew Kelley property (Woodside takes it’s name from that of his mansion) near the Snake Woods- which popular aphorism in the 19th century referred to as “Suicide’s Paradise”. 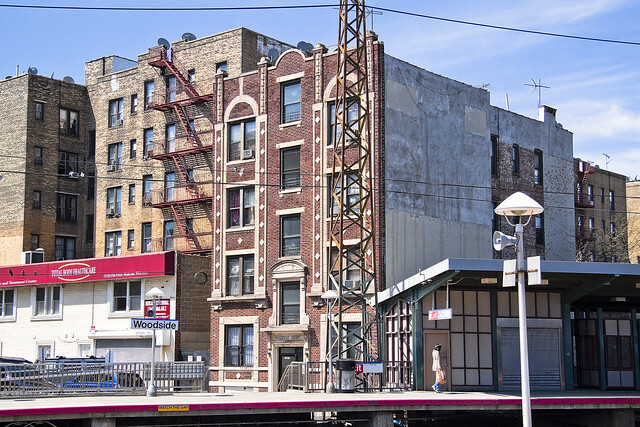 The actual spot that the LIRR station occupies was first (european) occupied by the Puritan Wiliam Sackett, who later sold the property to a man named Levirich. 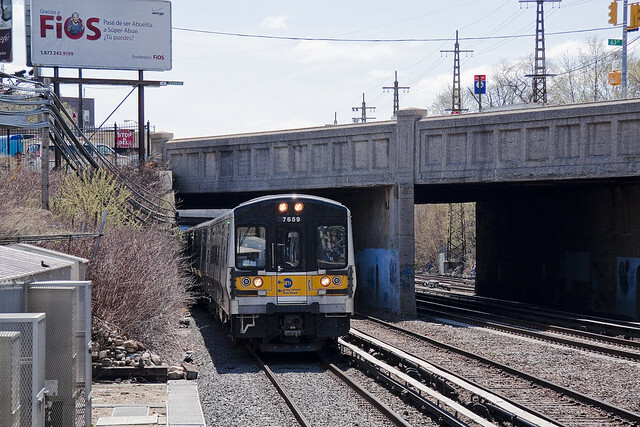 The LIRR arrived in the 1860’s and occupied several locations in Woodside until settling into the familiar layout of our modern tracks in 1917. The ancient Sackett farmhouse was scourged in a mysterious fire which occurred in 1890. Pictured above is Woodside Court, which the informed opine as being the oldest apartment house in the neighborhood, dating from 1916. Often have I wondered what it must be like to live in this place along the tracks. When this building was constructed, Woodside was an Irish enclave housing- along with Elmhurst- a substantial percentage of the refugees who fled from the 19th century holocausts, and their American born children. In Irish mythology, the aos sí (Irish pronunciation: [iːs ˈʃiː], older form aes sídhe [eːs ˈʃiːə]) are a supernatural race comparable to the fairies or elves. They are said to live underground in the fairy mounds, across the western sea, or in an invisible world that coexists with the world of humans. This world is described in “The Book of Invasions” (recorded in the Book of Leinster) as a parallel universe in which the aos sí walk amongst the living. In the Irish language, aos sí means “people of the mounds” (the mounds are known in Irish as “the sídhe”). In Irish literature the people of the mounds are also referred to as the daoine sídhe ([‘diːnʲə ‘ʃiːə]), and in Scottish Gaelic literature as the daoine sìth. They are said to be the ancestors, spirits of nature, or goddesses and gods. The story which microbiological experts transmit describes the Famines as being caused ultimately by the pathogenic organism known as Phytophthora infestans. Water based, this microscopic menace didn’t follow the immigrants to North America, as Phytophthora infestans is native to the place- just like the Potato. Originating in the mist shrouded highlands of central Mexico, Phytophthora infestans arrived in Ireland via a batch of potato seedlings sent to Belgium in 1845. Additionally, several modern states including the United States have made attempts at weaponizing the oomycete. A Fuath (pronounced foo-ah) (Fuathan pl.) is an evil, Gaelic mythological water spirit. In Irish Gaelic, the word “fuath” means “hate”. Its name is sometimes used as a regional variance for Kelpie or Uisges in Northern Ireland or the Bean-Nighe. The Scottish use the name to refer to generic water spirits who inhabit the sea, rivers, fresh water, or sea loches. Sometimes, this name is even given to highland or nature spirits, but all forms with the name are evil. Their appearance ranges from covered in shaggy, yellow fur to just having a mane down its back, webbed toes, tails with spikes, and no nose. They are prone to wearing green, whether it be a dress, robe, or kirtle, as it is the color of faeries. They sometimes intermarry with human beings (typically the female), whose offspring will share a mane, tail, and/or webbed digits. Their banes include sunlight and cold steel, which will kill them instantly. They grow restless upon crossing a stream. An alternative name for this class of monsters is Arrachd. Mitch, the fellow in this painting was you in another life?